CLEMSON, SC - Freshmen WR's Joe Ngata and Frank Ladson each had over 100 reception yards, but Ladson's White team got the better of it with a 30-10 win in front of 60,000 in Death Valley. Another freshman stood out ob defense, as Sheridan Jones forced a fumble and had a 42-yard pick-six for the last score of the game. 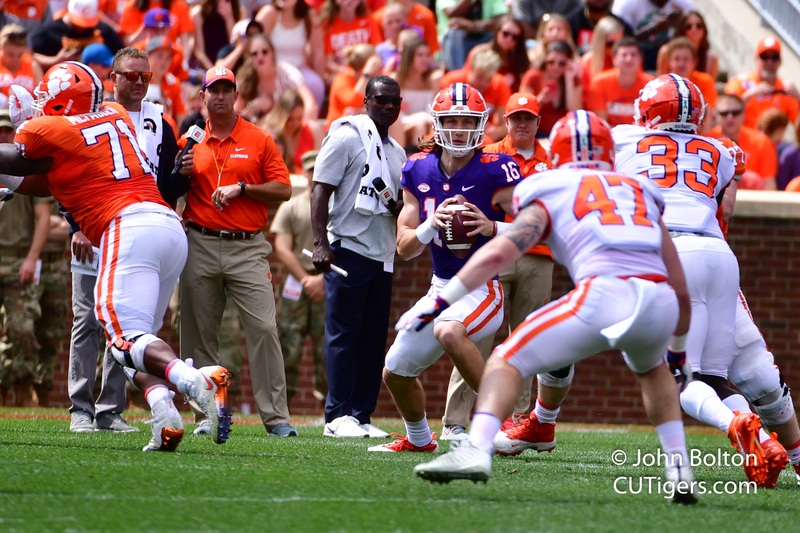 Trevor Lawrence was 19-34 for 232 yards for the Orange team, with a TD to Tee Higgins and a late 4th down INT by Terrell. Brice was 10-19 for 165 yards with a TD to TE Braden Galloway. Freshman QB Taisun Phommachanh played well, going 8-14 for 85 yards. He made a nice throw across the middle on the run to Ross for 25 yards. Sawicki was 3-3 on FG's, including 2 from 43! Freshman Aidan Swanson and Will Spiers both had a good day punting, so it will be an interesting battle at both kicker and punter this August. I'll have more to come. Post-game interviews are below!